Today marks the 200th anniversary of the birthday of Harriet Beecher Stowe. She was the author of one of the greatest American novels: Uncle Tom's Cabin. This piece of literature, published in 1852, convinced many skeptical Americans to adopt an anti-slavery position; the book is viewed as one of the major influencers of the Civil War. Upon meeting Stowe, President Abraham is said to have remarked, "so you're the little woman who wrote the book that made this great war." I love that a person with a perspective was able amplify it to stratospheric levels using only words. Although I've never fully read Uncle Tom's Cabin*, I think of it fondly because of my neighborhood. Harriet moved to Walnut Hills when her father, Lyman Beecher, took the presidency of the Lane Seminary (located where the Cadillac dealership on Gilbert Avenue stands today). Here she met her husband, Calvin Stowe, who was a professor at the seminary. In 1848, Harriet's young son died of cholera, and she could not escape the grief she associated with Cincinnati. She left two years later but was able to utilize her experiences while living here for her book. Harriet traveled throughout the region and saw slavery firsthand in Kentucky. She even had a friendship with John Rankin, a Presbyterian minister who was a conductor on the Underground Railroad. Stowe's Cincinnati home still stands in our community. It is well-maintained by a local group of racially diverse women who wish to honor Harriet's legacy. It's yet another reason I'm proud to live in this neighborhood. On the day of her birth, I'm grateful for those like Harriet Beecher Stowe who use their talents to make the world change the way we see things. *I tend to lose focus with the book's antiquated language but I continually come back to it for insight. It's in public domain—available free online and in audio format too. I always spend some time on September 11th watching television specials concerning the tragedy. I just have to watch. Even seven years later, the magnitude of that day is stifling. My coworkers and I sat crowded around a small television that morning in awe of the scene. But the distinct memory I carry with me is the instant the second plane hit the World Trade Center. It was in that moment that we realized that this was no accident— America was under attack. My heart still breaks about that day. May we never forget. Whether or not you're a geeky scholar like me or have absolutely no interest in archaeology, it is imperative that you check out this week's report from the Jerusalem Times about an ancient discovery which confirms numerous facts concerning the Christian faith. READ THE ARTICLE FROM THEIR SITE HERE. I'll post more when I familiarize myself with it but I've gotta make you understand: you know the rules and so do I . . . you wouldn't get this from any other guy. On this date, in 1988, music brilliance was recognized and this song received the honor of being dubbed Billboard's number one song. Taste the greatness here. This is why people love the eighties. Not trying to go all Geraldine Ferraro here but, when I heard this song on the radio, I swore the guy was black. I've always been fascinated with the assassination of President Kennedy. I'm not a conspiracy theorist per se, but you have to admit that the occurrences surrounding JFK's death in November 1963 are peculiar enough that we still discuss them today. So on my recent trip to Dallas, before my conference started, I went downtown to Dealey Plaza to see the site and visit the museum now located at the Texas Book Depository site. The museum itself is mainly located on the sixth floor of the building, the floor where Lee Harvey Oswald fired his shots. No photography is allowed in the museum, which is filled with photos, time-lines and artifacts. The tour is self-guided; your given an mp3 player with headphones to go through it. As I remembered the Oliver Stone movie that suggested Kennedy's assassination was a conspiracy, there was just one thing that stood out to me while on the sixth floor. Oswald, after shooting the President, was supposed to have ran across to floor to a stairwell, hidden his rifle, descended four flights of stairs, and made it to the lunch room in 90 seconds. I'm just saying, the guy must've been fast. I also never realized that Oswald was only 24 years old. It was a little bizarre to see how some people acted around the place. I understand the need to take a few pictures but what possesses someone to pose smiling in the place where someone was killed? 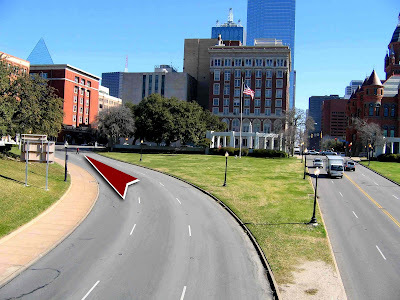 Check the picture below [taken from the overpass, with the Texas Book Depository behind the trees to the left] and you'll see at the other end of the arrow the dipwad who wanted his picture taken where JFK was shot. Even more ironic is it wasn't even the right location. Tourists . . .
That's why I found this map particularly enlightening. It shows the territory of the Cherokee nation [of which I am a descendant, by the way] which, before the American Revolution, found it's northern border at the Ohio River. After the war, their territory was reduced significantly, and now they have only a small portion of land between Alabama, Georgia, and Tennessee. It's impossible to go back in history and correct the wrongs that were committed that we now benefit from today; reparations are impossible to make and, in my opinion, pointless anyway. But we can learn the lessons from the past. We can accept who we really are. We are a nation of immigrants but once we build a foundation we fear losing what we've built. So instead asking for the tired, poor and huddled masses, we tell them to go back to their own country. Wonder if the Indians felt the same way. I recognize that there are many issues concerning immigration that are need to be flushed out; people need to be legal, people need to pay taxes [well, as long as I have to anyway]. But we shouldn't persecute immigrants. This is a great country. There's plenty of space for all of us. If we're truly thankful for our country, we shouldn't hesitate to allow others to enjoy it as well. For an explanation on the Cherokee map, read the full article here. *Sidenote: Many who push for English to be declared our language do so out of fear of the spread of Spanish in our country; they're worried that they'll be outnumbered and will lose their culture. This too is expressed frequently by nativists throughout American history and yet it never became a reality. There have always been communities of immigrants in this country who maintain the use of their own language. Eventually immigrants, who understand the importance of learning the prevalant language, adapt to English, usually at the expense of their original culture. The Marine Corp is 232 years old today. When my father served he spent time at Paris Island and Camp Lejune, in addition to some time in Okinawa and a few tours in Vietnam. Surprisingly, neither I nor my brothers served in the armed forces.